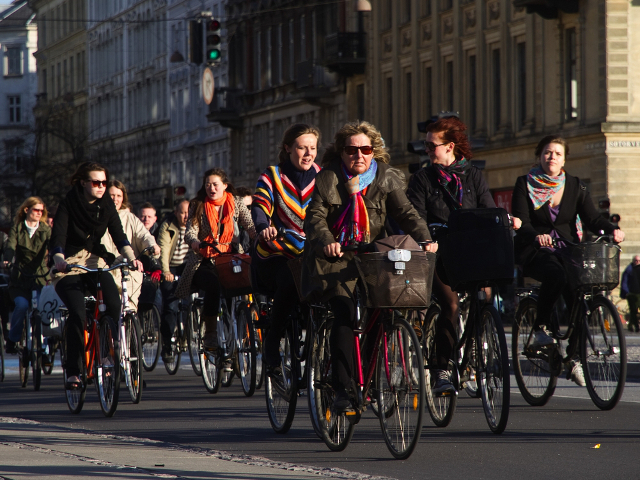 Cyclists ride in Copenhagen, the second most bike-friendly city in the world. Photo by Copenhagenize Design Co.
Last month, Copenhagenize Design Co., a consulting firm specializing in bicycle advocacy, announced their ranking of the 20 most bicycle-friendly cities in the world. Though dominated by European cities, the list has inspired cities around the world to work towards being more cycle-friendly. These bonus points helped some new cities to make their way on to the list. Rio de Janeiro, which is ranked twelfth, gained bonus points for “particularly innovative planning projects, social acceptance, and political will.” Seville, Spain also benefited greatly from the bonus points, ranking fourth on the list in part because of an 80 km bike path which was completed in one year. Seville is a good example of a country which has worked hard in the past few years to improve its bicycle-friendliness. Since 2006, the bicycle’s share of transportation in Seville has increased from .5% to 7%– a striking increase. This is accounted for, in part, by the city’s successful new smartbike bike-sharing system. The list has almost no representatives from developing countries. But many developing cities are working hard to be competitive the next time such a list is released. In Turkey, where none of the cities were even indexed, let alone ranked in the top twenty, efforts to increase bicycle-friendliness continue. Turkey’s ministry of Environment and Urban Planning recently announced that it has allocated the equivalent of 1.5 million USD towards improving bike paths throughout Turkey. Istanbul’s Metropolitan Municipal Environmental Master Plan calls for the construction of at least 1,000 km of bike path. The current ranking is the second list published by Copenhagenize. The first was published in 2011. This post was originally published in Turkish by Esra Suel for TheCityFixTurkiye. To read the original, visit https://thecityfixturkiye.com/2013-copenhagenize-bisiklet-dostu-kentler-endeksi/.